Monarch butterfly at the Cape May Point State Park on Sunday September 19, 2010. Monarch butterflies at the Cape May Point State Park on Sunday September 19, 2010. Snow geese land in a corn field along Roadstown Road in Hopewell Township on a frigid day, Monday Dec. 22, 2008. One of the two adult Harp seals, released into Great Bay on Feb. 12, 2005, looks up from its pool at the Marine Mammal Stranding Center in Brigantine. The Stranding Center asked that we be very general as to the location of the release because the animals often hang around the area for a while and people sometimes try to find the seals if they know the spot where the animals may be. A immature osprey flaps its wings from its nest above the Maurice River in Millville. A adult osprey circles overhead trying to chase off the banding party. Hans Toft, a natural science teacher at Cape May County Technical High School in Cape May Court House, is licensed by the state to band osprey chicks in the nest for the federal bird banding project. Each year at this time, Toft takes a group of his students into the back bay marshes between Cape May Court House and Stone Harbor, to check on the conditions of the chick and to band the young birds of prey. Wednesday Jun 30, 2010. (Dale Gerhard/Press of Atlantic City). An adult osprey flies from a perch as the banding party approach the nest. Hans Toft, a natural science teacher at Cape May County Technical High School in Cape May Court House, is licensed by the state to band osprey chicks in the nest for the federal bird banding project. Each year at this time, Toft takes a group of his students into the back bay marshes between Cape May Court House and Stone Harbor, to check on the conditions of the chick and to band the young birds of prey. Wednesday Jun 30, 2010. (Dale Gerhard/Press of Atlantic City). LOWER TOWNSHIP — Donnie Manchester and Michael Brokenshire, two birders from Cape Cod, camped out on a dune walk overlooking the marshes at Cape May Point State Park. Of all the places in the United States, this little walkway mound was the best in the country, they judged, to intercept their favorite bird, the peregrine falcon. These falcons are extraordinarily difficult to find because they are small, uncommon and incredibly fast. During their migration, they cover vast distances, making the chances of glimpsing one slim in most places. But Cape May is not most places, which is why Manchester and Brokenshire parked themselves, their folding chairs and their spotting scopes on the same hill for two solid weeks. Their choice was rewarded with peregrines galore. Like crop dusters, the fastest birds on the planet even buzzed over the heads of the two friends, helping them fill up the memory cards of their cameras. The story of wildlife in New Jersey is the story of migration. Everything, it seems, is coming or going, changing the landscape of the state practically every day for those with the time or inclination to look. And look they do. New Jersey’s wildlife bounty is largely a happy accident owing to its geography. It sits on the southern fringe of northern species such as snowy owls and harp seals and the northern fringe of southern species such as southern gray tree frogs. With its mix of coastline, mountains, meadows and pines, New Jersey has remarkable biological diversity with more species found here than Yellowstone National Park. Birds across North America are continuously on the move: mating, raising young, eating or not being eaten. “If you don’t go, you die,” naturalist Louise Zemaitis, of Cape May, said. She studies the migration of butterflies and dragonflies from Cape May and leads ecotours in Belize each year. “Birds need protein in the form of insects. They can’t get them here in the winter,” she said. New Jersey’s prevailing westerly winds carry birds to the coastline where they get funneled into an ever-tighter cone that starts in Camden across to Ocean County and peaks at the Cape May County peninsula. At the World Series of Birding, a New Jersey contest held each May to find the most species in 24 hours, the winning team recorded 228 species this year. But this variety is not even the state’s biggest draw, Dunne said. “The thing that makes Cape May so unique — and I use this word with a great deal of premeditation — is the sheer volume of birds that pass through here,” he said. He began counting hawks from Cape May Point State Park in the 1970s. This became New Jersey Audubon’s annual Hawk Watch, a bird census that takes place from an elevated deck the size of a small back yard. Birds are tallied by the thousands on a good day: sharp-shinned hawks, kestrels, ospreys and eagles all passing within view of the Cape May Lighthouse en route to their winter home as far south as Brazil. 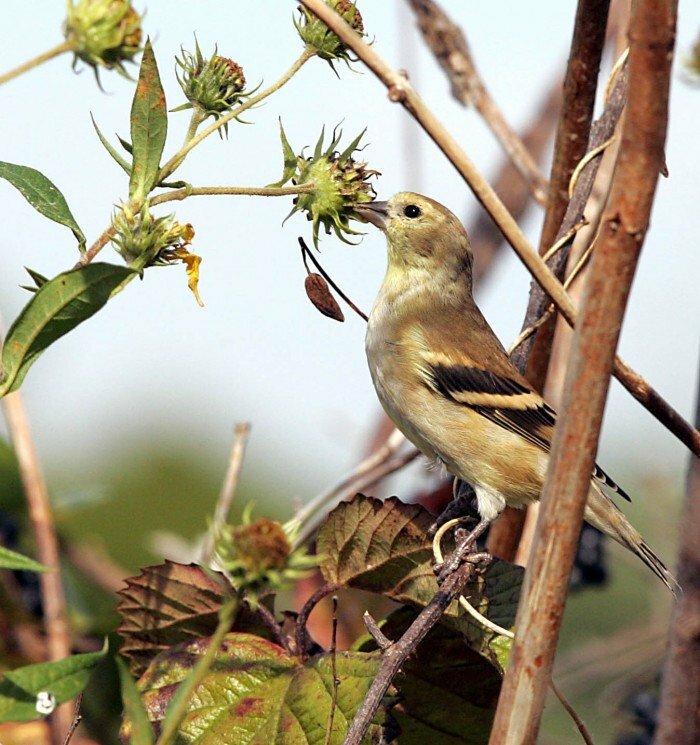 Birds are only the most obvious migrants that come and go in New Jersey. Monarch butterflies heading toward their wintering grounds in Mexico this year draped tree branches in one of the greatest displays ever seen in New Jersey, said Gretchen Wilson, director of the Cape May Nature Center. Likewise, some of the largest animals on the planet come within seashell-skipping distance of the beach. Humpback, fin and right whales are making their southerly migration now along the coast, drawing admirers wherever they go. Adult males and females with calves spend the winter off the Dominican Republic. But juvenile whales prowl New Jersey waters throughout the year, said Capt. Jeff Stewart Jr., who pilots the Cape May Whale Watcher tourist boat in Lower Township. “This is a nutrient-rich area. We observe them feeding on a regular basis,” he said. Fin whales are the second-largest animals on Earth, but try finding one in the vast Atlantic Ocean, Stewart said. And in October some whales came remarkably close to shore. “We’ve seen a huge number of sightings of humpbacks this fall off Long Beach Island and Atlantic City,” said Bob Schoelkopf, director of the Marine Mammal Stranding Center in Brigantine. He once saw a humpback whale breach high out of the water within view of the Atlantic City Boardwalk. Sights like that are unusual but memorable. The stranding center is busier now as harbor, harp and gray seals venture away from their Arctic breeding grounds to spend the winter loafing on New Jersey beaches. Every year, the center catches seals — most of them pups — afflicted by parasites or illness and too weak to survive on their own. Last year the center even caught a wayward manatee that ventured up to Linden, Union County, in October, despite cold northern waters that likely would have doomed it. The U.S. Coast Guard flew the sea cow back to Florida, where it was released near Miami. Thanks to advances in technology, researchers are spending more time studying the survival strategies of long-distance travel and the potential risks it entails. Tiny data loggers allow them to track animals day by day as they traverse the globe. Loss of habitat and the spread of human development take a yearly toll, New Jersey Audubon’s Dunne said. One day in the 1980s, Lower Township police called on his expertise to explain why dozens of dead birds had been found in two suburban yards. The explanation was less intriguing than the question. Migrating flocks of thrushes and warblers had descended on the county and, ignorant of the terrain, struck windows in the neighborhood. Dunne had found two dead outside his hotel room in Wildwood Crest the same morning. “For years I have speculated that one of the reason bird populations have been declining so steadily is because of the mortality caused by birds striking glass,” he said. Some studies have estimated that bird strikes number more than 100 million each year in the United States, bad news for birds that hop the continent twice a year. And wildlife migrating through New Jersey soon will have another obstacle with which to contend: offshore windmills. “It’s a huge question. The judge and jury are still out,” Dunne said. Wind companies are studying migration patterns off New Jersey’s coastline to minimize the effect turbines might have on wildlife. Nobody knows how whales will respond, Brigantine’s Schoelkopf said. “It’s going to be a watch-and-see operation. Let’s put the windmills in and see what it does to the marine mammals,” he said. A two-year study by the state Department of Environmental Protection suggested ocean turbines would pose little risk to migrating birds, which typically stay closer to land or fly high above the water. The exception is in Cape May, where the birds drop to forage and rest. For that reason, among others, wind farms are being steered to waters north of Stone Harbor and away from the Delaware Bay, said Gary A. Buchanan, manager of the state Office of Science. “Most birds fly 1,000 feet or higher when they are in full migration. 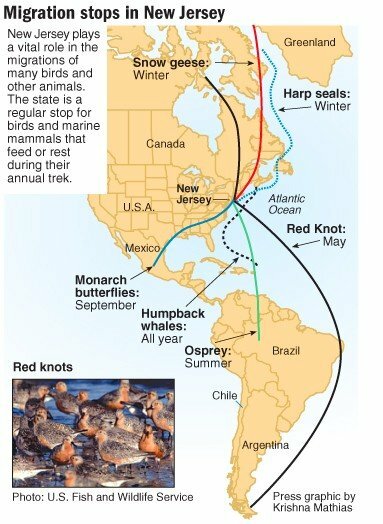 But we were concerned with that because Cape May is an internationally known birding area. Lots of birds stop there before crossing the Delaware Bay,” he said. Likewise, construction noise from building the turbines could disturb passing dolphins and whales. But once they are finished, the turbines are expected to have little impact on marine life, he said. But state and federal agencies will monitor the long-term impacts, he said. All of this wildlife activity has not gone unnoticed. Local businesses such as the Blue Fish Inn in Cape May have capitalized on this interest, offering discounts to birders and package deals to tour operators. Members of New Jersey Audubon get 10 percent off their stay, Blue Fish Manager Natale Chew said. Chew said she has learned to spot a birder in a crowd, even without their favorite accessory, binoculars. “They have a distinctive look about them. They tend to wear shirts with logos on them,” she said. These visitors typically leave their rooms early and spend long hours away from the hotel, she said. Birding and other outdoor recreation is a $500 million industry in Cape May County, according to a 2006 study by the county chamber of commerce. The two Cape Cod birders, Manchester and Brokenshire, estimated they spent more than $2,000 on the house they rented and their meals. Capt. Andy Grossman, 46, will spend Thanksgiving morning at his Brigantine bait shop, Riptide Bait and Tackle. Most of his business revolves around the spring and fall migrations of one fish — the striped bass — a popular game fish that spawns in freshwater rivers but lives mostly in the ocean. And Thanksgiving offers prime striper fishing in southern New Jersey. Fishermen study the migratory patterns of striped bass to catch the peak arrival times, which can change from year to year, Grossman said. The wildlife diversity attracts enormous attention from naturalists, researchers and international tour guides. “Many a drawing I made at Egg Harbor, and many a pleasant day I spent along its shores,” he wrote. Perhaps had he known more about New Jersey migration, he would have come at Halloween instead — and brought a chair.